With the increase in purchases of Apple products and the regular lauch of new technologies there’s no question Apple will influence many aspects of your modern life. This handy Infographic depics which works best where? With its, now laughable, 1k(64k max) of RAM, it was our first step into the digital age! The ZX81 sold 20,000 units in just 9 months and 100,000 units in eighteen months. The Spectrum range was among the first mainstream audience home computers in the UK, similar in significance to the Commodore 64 in the USA. 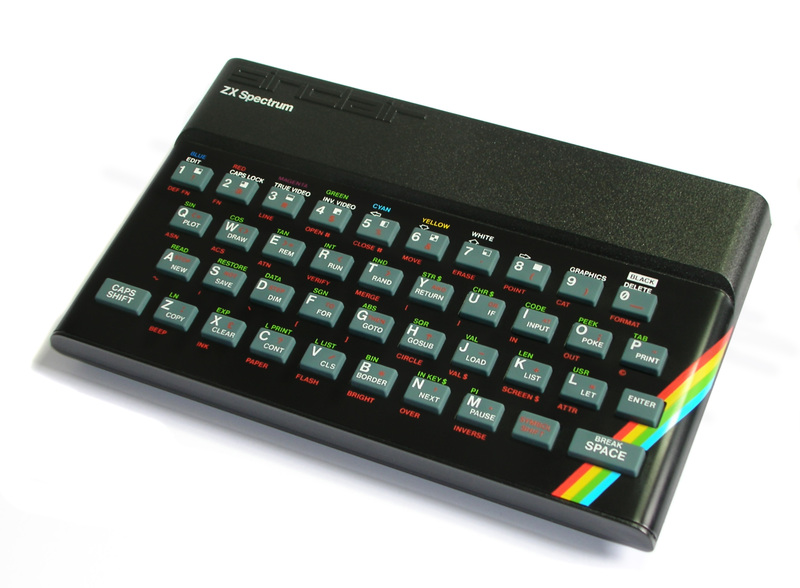 The introduction of the ZX Spectrum led to a boom in companies producing software and hardware for the machine,the effects of which are still seen today. We then cycled through various manufacturers like BBC, Commodore and then main stream manufacturers that still exist today. Now I am Apple infused, Mac’s, iPad’s, iPods, iPhones I am an apple fan. Why? They are all connected and provide a seamless experince between devices. They are also cool and great looking! Apple is annually selling almost as many devices (including computers, iPads and iPhones) as cars worldwide. Unsurprisingly, they are also one of the most successful businesses in the world. But how do Apple’s eye-popping statistics translate to the real world? The sum of their total sales in 2011 was an incredible $128 billion. To put it in perspective, their 2011 sales amounted to more than the GDP of 160 nations worldwide. Apple’s current market capitalization is $508 billion making it the largest company in the world. Apple’s release of its latest iPad was massive: the company sold 3 million devices in the first 72 hours of release. 695 iPads are sold every minute. 11 iPads are sold every second. Apple projects to sell 56.4 million iPads in 2012. Laid end-to-end those iPads would stretch from Cupertino, California to New York City and back and nearly halfway back to the Big Apple. Since 2008, almost as many devices with Apple’s IOS operating system were sold as cars worldwide. Does that mean that in today’s world we consider Apple products as important as vehicles? While the iPad has been a huge success, the iPhone is still Apple’s franchise player selling over 72 million devices in 2011. That’s nearly equal to the weight of the Eiffel Tower. 40% of Apple’s revenue is credited to the iPhone alone. This Valentine, Cupid went mobile! Having spent a great deal of time over the last two months dissecting the influence of the empowered consumer. Throughout that time, the conversation has focused primarily on the emergence of the mobile shopper. Now just more than six weeks into the new year, we are thrilled to report that mobile shopping remains a staple of the retail landscape whether through an iPhone, iPad or an Android device. Specifically in an analysis of online shopping the week leading up to Valentine’s Day, the IBM online Benchmark study found that 14.5 percent of all online sessions on a retailer’s site were initiated from a mobile device. As for sales, 10.1 percent of all online sales for the week before the Valentine’s Day holiday came through a mobile device. Sound familiar? Well it should. These figures for both traffic and sales are almost identical to what we saw over the recent Christmas holiday where traffic and sales were 14.6 percent and 11 percent respectively. What this tells us is that the mobile shopping habits witnessed over the November and December holidays are not fleeting. They’re actually quite the opposite. A permanent change is in affect with the empowered consumer turning to mobile devices not just for blockbuster shopping days but for all holidays and shopping occasions in between. Jewelry and Intimate Apparel: A record number of consumers made impulse buys via their mobile devices with mobile sales of jewelry and intimate apparel growing to 28.8 percent and 17.7 percent respectively. Health and Beauty: Shoppers continued to demonstrate a desire to pamper their loved ones with mobile sales of health and beauty items (lotions, fragrances and more) growing to 15.1 percent, an increase from less than 4 percent in 2011. Apple’s iPhone and iPad ranked one and two for mobile device retail traffic (5.5 percent and 4.9 percent respectively). Android was third at 4.4 percent. Collectively iPhone and iPad accounted for 10.4 percent of mobile device retail traffic so far this month. It’s exciting to see the promise of mobile remains strong and I cannot wait to see how it continues to influence both shoppers and retailers as we move forward. As for now it’s safe to say that Valentine’s Day shopping has evolved from the standard box of chocolates. Consumer Spending Increases: Online sales were up 5.4 percent over 2010. Mobile Traffic: 15 percent of all online sessions on a retailer’s site were initiated from a mobile device, up from 5.6 percent over this same period in 2010—an increase of 169 percent. Mobile Sales: Sales from mobile devices grew, reaching 12.9 percent versus 4.5 percent in December 2010—an increase of 186.5 percent. The Apple Shopper: Apple’s iPhone and iPad ranked one and two for mobile device retail traffic (6.4 percent and 4.7 percent respectively). Android was third at 3.6 percent. Collectively iPhone and iPad accounted for 11.1 percent for the month. The iPad Factor: Shoppers using the iPad also continued to drive more retail purchases than any other device with conversion rates reaching 6.1 percent compared to 3.8 percent for all mobile devices. These early Christmas season findings are based on data from IBM Coremetrics Benchmark, the only analytics-based, peer-level benchmarking solution that measures online marketing results, including real-time sales data. All of the data is aggregated and anonymous. Coremetrics Benchmark uses IBM’s cloud-based digital analytics platform to rapidly collect and analyse intelligence on how consumers are responding to the products and services being offered to them, enabling clients to make accurate decisions on marketing expenditures. As a result, marketing teams can gain deeper insight about their consumers and present personalised recommendations, promotions and other sales incentives across the wide variety of channels—including social networks and mobile devices—where consumers interact with their brands.